The price of gas at Shell stations in Florida is considerably higher than the regional average. 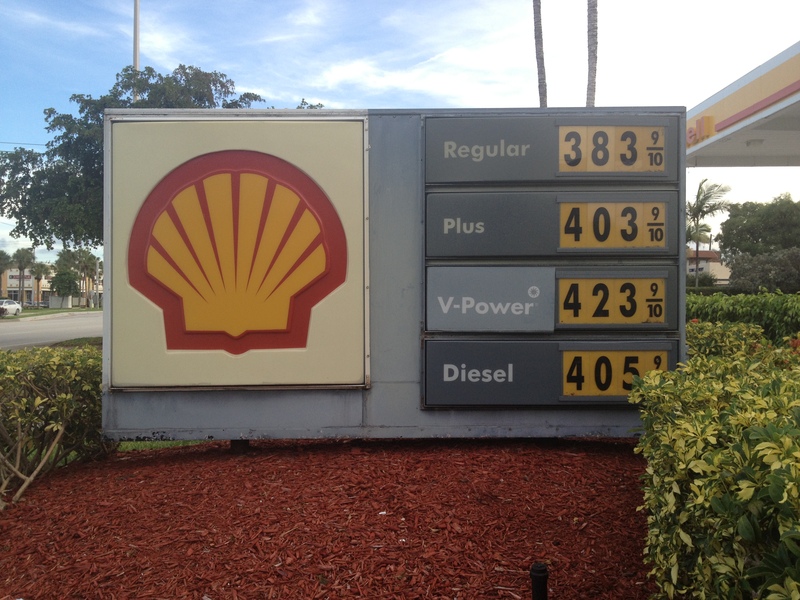 Shell has the contract for the gas stations on Florida’s Turnpike. Photo taken July 29, 2013. The average price of a gallon of regular unleaded gas slipped about four cents per gallon in the past week, according to the weekly pricing survey from the U.S. Energy Information Administration, but the offset was hardly noticeable in some cities, where the price of gas kept going higher despite the numbers reflected in government pricing surveys. 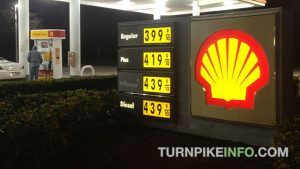 In fact, Shell Oil, which has the contract for the service plazas on Florida’s Turnpike, had some of the highest prices for gasoline in the South Florida Metro Area, including Fort Lauderdale, where some stations were charging more than $3.80 per gallon, even though the average for Gulf Coast and Lower Atlantic states is more than 30¢ per gallon cheaper. Conversely, in New Jersey, where pricing controls are in place, and tied to the consumer-based Lundberg Survey, the current price gas is $3.61 per gallon, which is below the EIA survey price for the East Coast U.S. The pain at the pump comes into focus when comparing prices to one year ago, when the average cost of a gallon of gas was hovering around the $3.50 range. Right now, the average U.S. gas price is about $3.65 per gallon, although that number is down from last week. For truckers, the price if diesel kept rising during the past week, with the average per gallon price, nationwide, now at about $3.92. In some states, particularly on the U.S. West Coast, the price is well above $4.00 per gallon. New England states also saw diesel prices keep rising above the 4-dollar mark. Interestingly, the pricing charts for crude oil and gasoline closely mirror each other, primarily because of the way fuel distributors’ accounting practice, which reflects a “last in, first out” inventory pricing policy. That strategy accounts – no pun intended – for the fact fuel distributors charge more for gasoline the moment crude oil prices begin to spike. The cost of existing inventories, which may have been less expensive, are not typically part of the immediate pricing equation. Florida’s Turnpike will now accept the North Carolina Quick Pass for payment on Florida’s Turnpike, it was announced today. Conversely, Florida’s SunPass can now be used to pay tolls on the Triangle Expressway in the North Carolina Research Triangle Park region. The announcement was made by both states’ Departments of Transportation in what had been an expected union of the two electronic tolling systems. The North Carolina tolling system participates in the broader E-ZPass electronic toll system, which covers states across the entire middle and upper Atlantic regions, New England, and the Midwest. Until now, Florida had never participated in any interstate electronic tolling system. Connecting with North Carolina is a likely first step in Florida becoming part of the larger E-ZPass network at a time when the state is making significant technology upgrades to its toll roads and toll collection systems. Florida’s Turnpike Extension, located in Miami-Dade County, became the first leg of the turnpike system, in the Sunshine State, to become an all-electronic tolling system. However, no timetable has yet been posted detailing when SunPass might be accepted in other states or when E-ZPass, particularly from states like New York and New Jersey, might be accepted in Florida. Julius Caesar was warned about “the Ides of March,” but for modern drivers, the Ides of July brought the bad news of gasoline prices surging across the U.S., up almost a quarter per gallon in some places. The latest pricing survey from the Energy Information Administration shows the average price of one gallon of regular unleaded is now $3.64 per gallon, up an astonishing 15-cents in just one week. Drivers in the Midwest, where weather conditions in May created gas price havoc, are reliving the price shock at the pump, only worse. Prices leaped ahead by an average of 23-cents per gallon across nearly all of the Midwest. Only the Rocky Mountain states and the broader West Coast states escaped such drastic price swings during the past week, but prices still increased by about 9-cents per gallon in most states west of the Rockies. Cost instability also afflicted truckers, at least moreso than during most recent weeks. The avereage price of a gallon of diesel fuel ticked upward by about four cents; but areas of the Gulf Coast and U.S. West Coast saw prices rise more than a nickel per gallon. A number of factors could be contributing to the summer gas price increases, including fresh high prices for oil futures amid very tight supplies. Brent oil neared $110 per barrel as oil inventories decline and refinery capacity remains restrained this year. As mentioned, severe weather conditions across the Midwest during May cause shipping and refinery problems, and this year’s permanent closure of other refineries has also contributed to the cost pressure at the pump. Year over year, most American drivers are paying between 18 and 25 cents per gallon more for gas. Translated to a full fill-up of a 15-gallon tank, that is the equivalent of an extra $2.70 to $3.75 per gallon more per tank. Gas prices nudged upward in some regions, and truckers, in particular, found themselves paying more at the pump during the past several days as the price of a gallon of diesel began creeping higher in the wake of a spike in commodities prices during the past week. Overall, the price of a gallon of unleaded gasoline was fairly flat across most regions, although higher in New England and the Midwest. Diesel prices were broadly higher across the United States, but slightly lower in the New England and Rocky Mountain states. The prices are detailed in the latest weekly survey from the Energy Information Administration. The price fluctuations come amid a spike last week in crude oil futures, which came as unrest in Egypt gave rise to concerns about global supplies. However, crude oil prices were down from last week’s highs Monday. Still the summer driving season has been rocked by refinery issues and flooding problems in the Midwest, political unrest across the Middle East, and a train derailment in Quebec Saturday, July 6, that could further exacerbate supply issues, even though reserves remain fairly stable across North America. The average price of a gallon of unleaded, nationwide, was just under $3.50; although prices along the West Coast and California remained significantly higher, with some people paying upward of $4.00 for a gallon of regular unleaded. Prices of diesel remained at about $3.83 per gallon, on average, during the past week; however, truckers along the West Coast and in New England were paying at or above $4.00 per gallon. The month of America’s independence got off to an across-the-nation drop in gas prices, helping many people save anywhere from a few pennies to several dollars on a tank of gas, depending upon where they live. The decline in gas prices varied widely by region again this week, according to the EIA weekly survey, but for the first time in several weeks, drivers in every region enjoyed a drop in the cost of fuel. The average price of a gallon of gas fell by just over eight-cents during the week, with prices in the midwest continuing to plummet as the region continues to recover from dramatic weather and refinery issues suffered during May. The average cost of gallon of unleaded fell by 15-cents across the Midwest during the past week. In all, Midwest gas prices have fallen nearly 50-cents per gallon during the past three weeks. For most of the rest of America’s drivers, the price declines were far more modest, with the average driver outside of the Midwest seeing declines of anywhere from three to seven cents per gallon. As of July 1, the average U.S. cost of a gallon of regular unleaded was down to about $3.50; with prices in California and on the West Coast averaging $3.89 and $3.70, respectively. The lowest prices for fuel are to be found along the Gulf Coast, where a gallon of gas is about $3.31. For the truckers moving products, and in some cases gasoline, across the United States, the price of diesel dropped during the past week, as well. Price declines were seen in every region of the U.S., but compared to gas, the drop in diesel prices was very slim. Diesel prices per gallon fell by only about two cents per gallon, to a national average of about $3.82.